It’s been a crazy few weeks and we’re finally getting caught up on all the planting, weeding, seeding, and harvesting that’s been on our list for ages. Our new intern, Heidi (you may know Heidi from the produce dept of The Good Food Store or as HipHop dance prof at The Missoula Dance Collective, among other things), has arrived and is a stellar worker. We are SO happy she’s here. The goats are loving the luscious grass selection and the kiddos (Enrique, Loretta, and Little Bit) are growing fast and getting super playful. We’re making goat cheese and yogurt often, eating each at least once a day. 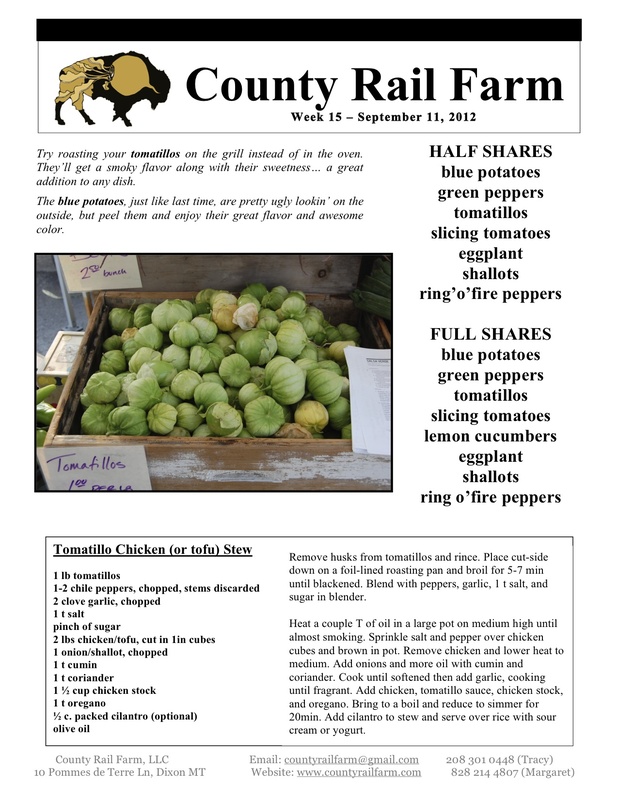 Our Farm Share (CSA) begins this week, and we’re super excited to see old and new members at pick up. 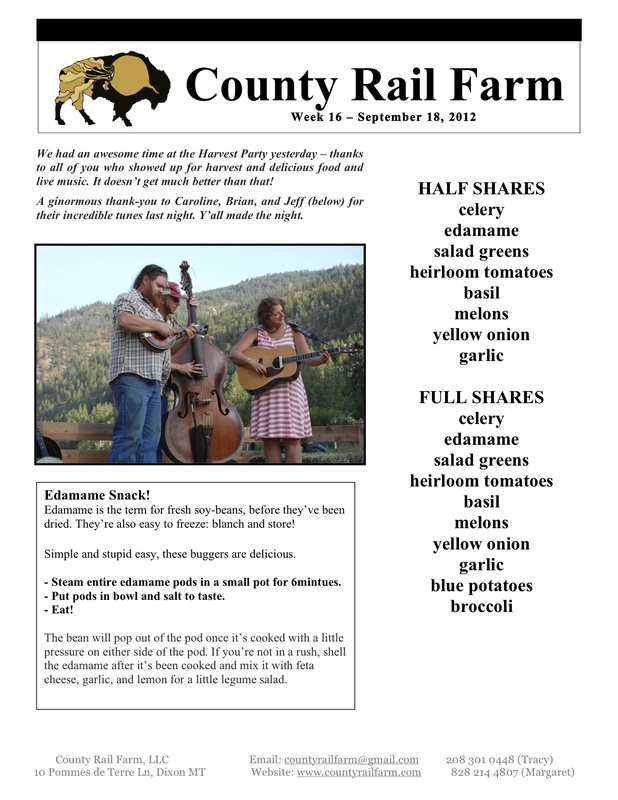 Just like last year, we’ll be on the green outside the Missoula Food Coop/Burns Street Bistro every Tuesday evening until mid-October. We’re even scheming to partner with the Coop for recipes and other delicious treats – yum! This week includes rhubarb, mint, and asparagus (the last, the very last of the season). 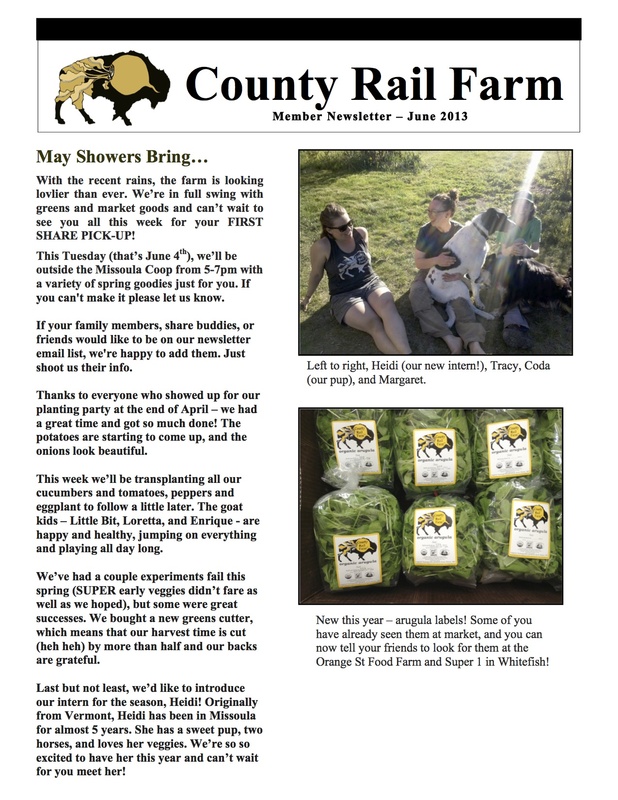 This year we’ll have monthly newsletters. 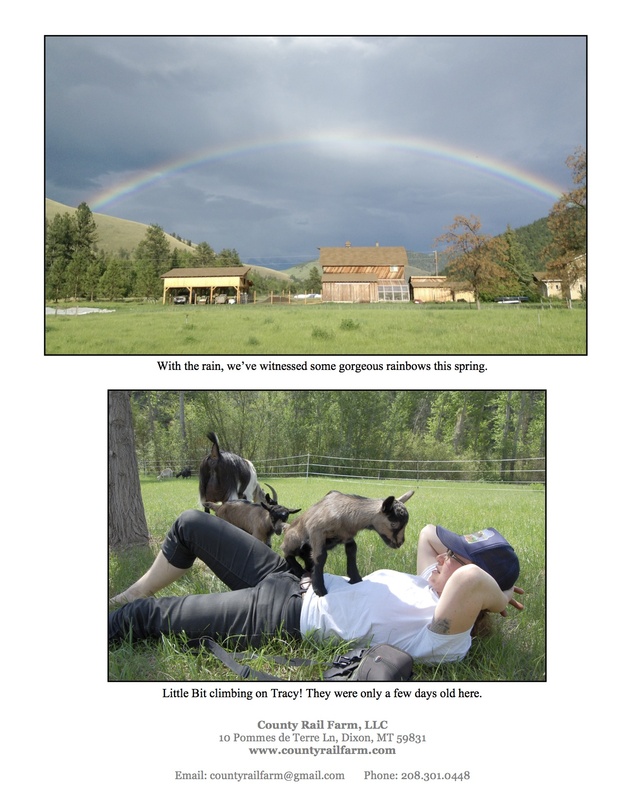 June’s is below, with a few choice photos for the springtime. Back in the Saddle, Again. So here we are in another year. The sun didn’t explode, the snows came, and firewood still burns hot. Margaret and I took November and December off to relax, travel, and not think about the farm. The first two we did totally successfully, the last task we did only marginally well. Thanks to our buddy Bob, we were able to take off for 2 weeks and drive down to Texas to see family, to ride our bicycles (!!!) around Santa Fe and Austin, see some fantastic live music, and eat incredible tacos. No joke, the best tacos we had were found at The Velvet Taco in Dallas. I think I was the only one giggling. Either everyone else shoving tacos in their mouth was already over the joke or didn’t get it. In December, we spent the holidays and New Years with my family in Idaho and toasted to 2012 on the ski slopes. The goats have been bred, both to freshen in May. Lucy is fat and bossy as ever, the kids are growing nicely, and Ke$ha is still the farm sweetheart. I butchered our whether, Bruno, in early December along with a number of older laying hens from which I made gallons of stock. Percy the cat had a little trouble with his usual acrobatics and ripped a hole in his belly that we had to get sewn up. He didn’t seem to mind either way, but now he has a gigantic scar to show off to the ladies in town. Since his stitches have been out, I’ve seen him jump from the car port roof to the greenhouse and back again multiple times. I’ve also seen him slide off the roof of the greenhouse on a slippery layer of new snow, landing on his feet. After boring weeks of recovery, he started leaving serious carnage around the house and barn: mice bodies, frozen to the ground, heads staring blankly from a few inches away. He has become an excellent barn kitty, and increasingly skilled at sneaking into the house to snooze by the stove. Our indoor plants are thriving with all the attention we’re giving them now that they’re our only greenery. I broke the lemon tree pot and built a new, larger, container for it filled with aged compost and plenty of water. It looks healthier than ever and is growing lots of new foliage. I’ve been reading books galore and catching up on some of the better tv shows out there (and my fair share of really bad shows). We’ve been making all kinds of delicious winter-y dishes with our stored, canned, and frozen produce and have been enjoying experimenting with making cheese from Pattie’s extra milk (thanks, Pattie!). When she’s not filling in at the Good Food Store, Margaret has been whirring away on her new sewing machine, making me a couple incredible vests and fixing up all kinds of stuff in the house. She also carved a super cute holiday card linoleum print of Coda running with a zucchini. 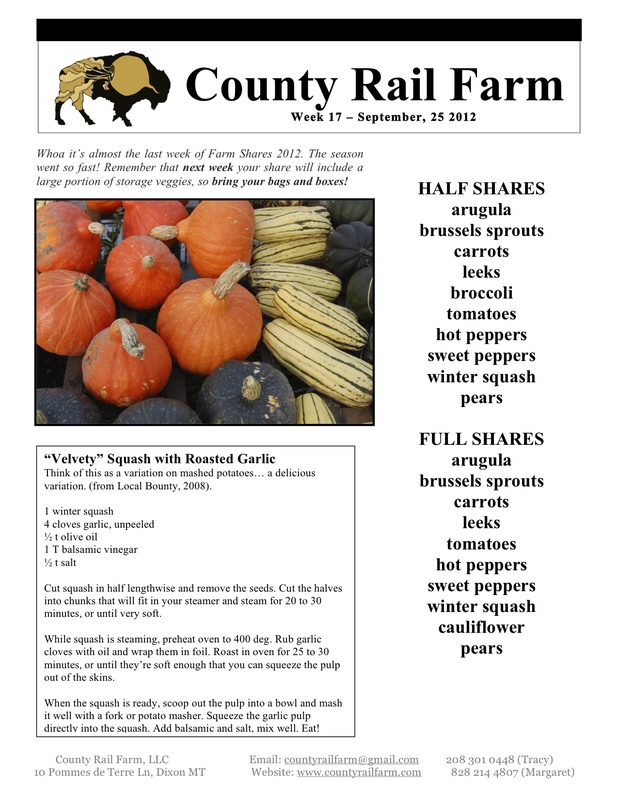 Now that 2013 has hit in full force, we’ve been pouring over seed catalogs, editing the website, and recording all our 2012 info. We harvested almost 13,000lbs of produce this year, not including plums, apples, or pears! 850lbs of arugula, 1,300lbs of salad greens, and 2,500lbs of english cucumbers. We’ve lined up a full time intern for 2013, in the hopes that we’ll get more time to enjoy the farm and more help to make harvest and production more efficient. You’ll meet her this summer, she’s super. Next season will see a few new things from County Rail. We’ll be trying some specialty greens on for size (in addition to our arugula and mizuna, of course) and we’ve decided to cut our losses and quit doing things that don’t work for us. Melons, for example, are falling by the way-side to make room for other stuff we grow well. Support our neighbors at Dixon Melons, instead. 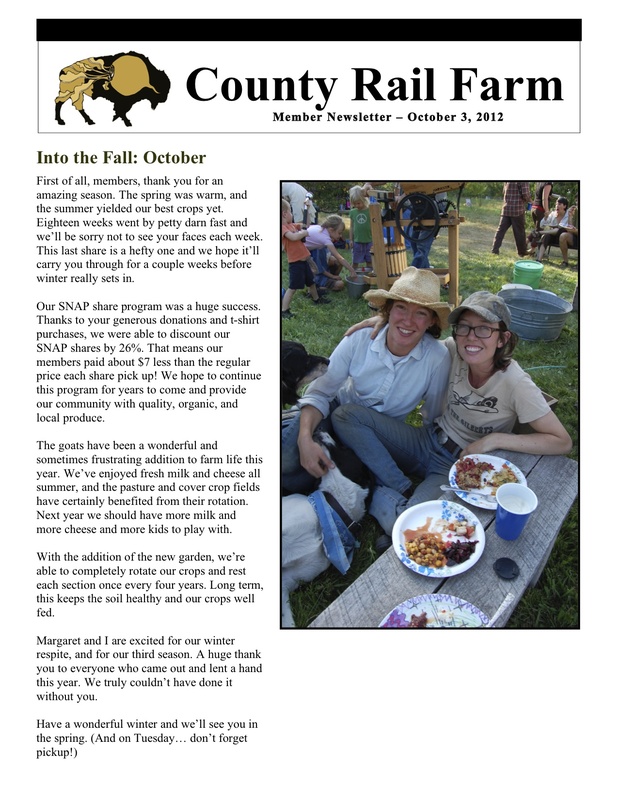 We’re keeping our CSA small at 25, and thanks to a hugely generous donation from a local philanthropist, our SNAP members will get an incredible deal on their shares this season. Check out the SNAP page for details. Margaret and I are psyched to be heading into our third season. Pommes de Terre has brought us nothing if not the feeling of home, fulfillment, and community. Farmers always say that next year will be better, and dog gamit, so it will. We’re always learning new tricks, tackling new challenges, and tweaking our system to make it more productive and sustainable. I’m trying out a new system here. You should see a slideshow of images below. 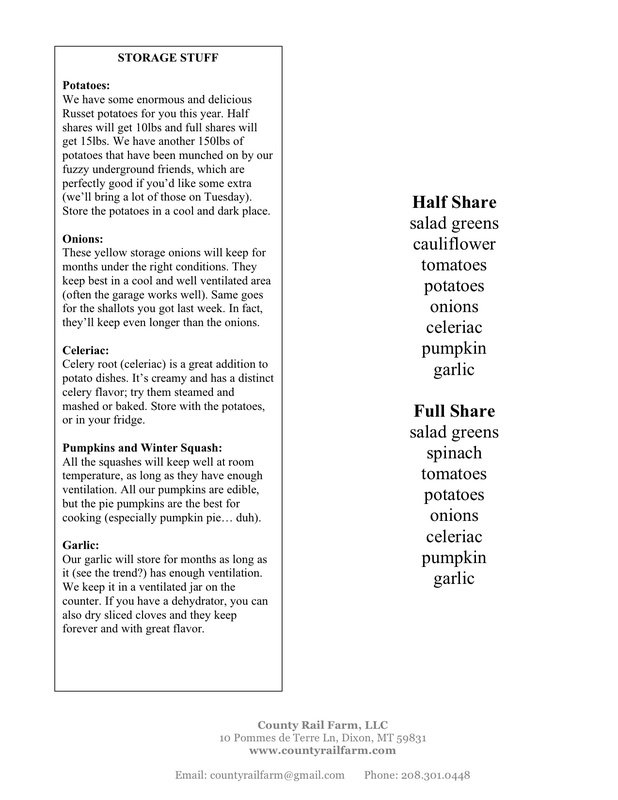 Share pick up from the end of September… yummmmm. Week 18: Thank you for a great season! Weeks 16 and 17: Fall is here.